"Friday saw the end of a week of chemotherapy. Jack tolerated it less easily than he has in the past, more sensitive to the nausea, the tummy cramps, the headaches. The toxicity. I too felt more sensitive than usual…. To the vile, noxious chemicals, that once again are being infused into his small body, causing an only too visible sickness. But without these chemicals the unseen sickness inside continues to grow rapidly.Richard's last update mentioned the spread of the disease which is now in both of Jack's legs. His bone marrow results this week showed it had leapt also in the marrow. His bone marrow which three weeks ago was clear, now has 10% disease, he has lost a kilo in weight. But there is so much reason to hope." Towards the end of Yvonne's update she says "Please take the time to visit Sam, (www.samanthahughes.co.uk), a beautiful little girl back home in the UK who relapsed in January. Sam's disease has taken off like wildfire. Neil explained they have no option but to stop fighting now, she is in a lot of pain and can no longer have blood transfusions. Neil has been a huge supporter and fundraiser for research back home. Please pray for Sam and her family." 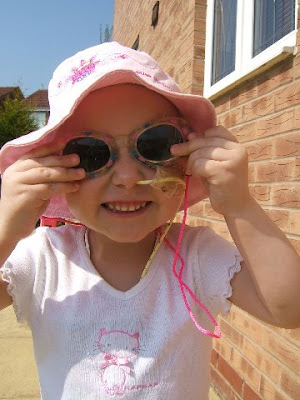 As a result of this I clicked on the link to visit Sam's site and hoped she was at the least comfortable, I was heart broken and breathless to read that Sam had in fact passed away on the 15th April, as you can see from the picture above she was a lovely little girl with her whole life ahead. Learning about Samantha and Jacks ongoing fight, has made me even more pleased to have chosen the charity Joining Against Cancer in Kids. 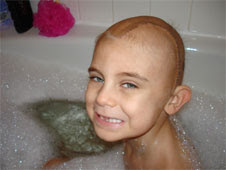 I really hope we can raise a lot of money to help find a cure for the desperate children who are fighting Neuroblastoma. Please spread the word to your friends and colleagues, and consider helping via the widget or via www.justgiving.com/markrobsonchannelswim Thank you very much indeed.